When I awakened, I decided to hit the trail early and get to the next town six miles away for breakfast. The day was spectacularly beautiful and the first real warmth on the Camino so far. I stripped down to just my pants on the bottom—no under layer—and a t-shirt under my coat on top. And even that had started to get a bit warm. The sun on my face was a welcome phenomenon, though I could feel that it would eventually penetrate my sunscreen if I wasn’t careful. It was an easy, flat, two-hour walk on a road build by Romans to Castrojeriz, a town that puts forth a spectacular display nearly the entire way by offering its Castillo standing sentinel in the distance. I stopped in a bar for breakfast—the basic pastry and coffee combination. The castle ruins rose up on the hillside out my window. I watched the sunlight hit the blades of grass. I marveled at the ancient stones that made up the walls around me. I thought of the people who have moved through, sitting in the same seat, drinking coffee from the same cup, maybe even thinking the same thoughts of somehow being totally removed from the world and totally immersed in it at the same time. 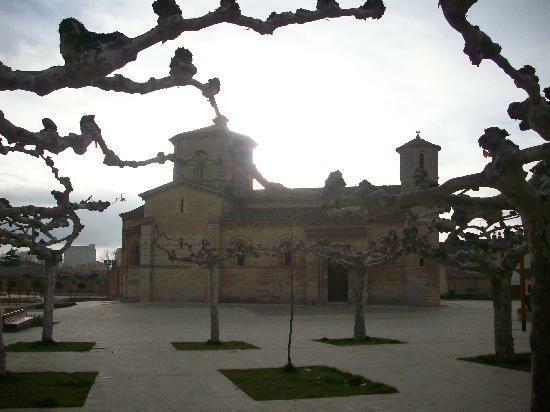 In my guidebook, on the Castrojeriz page, was a quote from Joseph Campbell: If you follow your bliss, you put yourself on a kind of track, which has been there all along waiting for you, and the life you ought to be living is the one you are living. I pondered the idea of bliss and if I was following it. Despite hoping that I’d put myself on a track that was leading to abundance and creative fulfillment, it was hard to really know. I certainly was pursuing a dream, but I was about to turn 40, and the dream hadn’t really materialized in the way I’d imagined it would. Thus, I was on the Camino looking for answers that might bubble to the surface in the midst of silence. Silence. I’d had a couple days of it, at least while walking, and now I was hoping for some companionship. 24. Two Weeks, 250 miles… Halfway! The Fromista refuge didn’t have heat or hot water. I’d slept well but obviously opted to pass on the shower. And I was looking forward to a short walk to Carrion—an easy, flat 13 miles. It had been two long days across the flatlands of the meseta, but it had been blessedly warm with winds that kept it from getting hot. 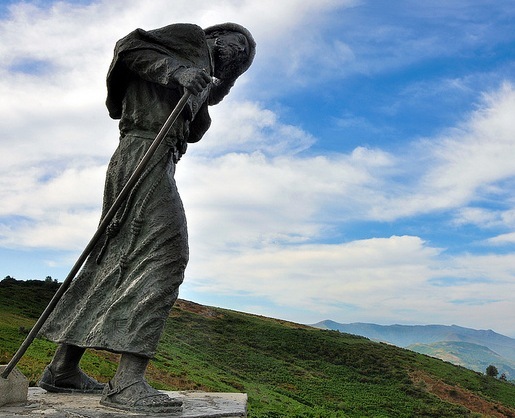 I couldn’t imagine walking the Camino in the summer. Much as I’d been surprised by the cold, it seemed far preferable to the heat of summer. I exited the refuge and stopped in the plaza outside the church one last time to admire the trees—trees whose branches reached out and clasped each other creating a fingered canopy. Not one tree stood isolated and alone; instead they were all linked together. I smiled, appreciating the beauty of nature that so aptly reflected my web of community and our intricate interconnections. After I’d exited the smoky bar the night before, I found Simon sitting among the trees watching the last vestiges of light disappear with the setting sun. I sat down next to him, and we enjoyed our dinner together. We’d each been to the store, and we laughed when we discovered that we’d gotten the same thing: a baguette, a can of tuna, a tomato and a chunk of cheese. It was becoming our meal of choice because it was readily available, inexpensive, light, easy to carry and filling. Instead of slicing the bread in half for our sandwich, we carved a V into the top to create a crevice that held everything more easily. It was one of my favorite discoveries on the Camino. 33. 425 Miles and I’ve Just Reached the Start! 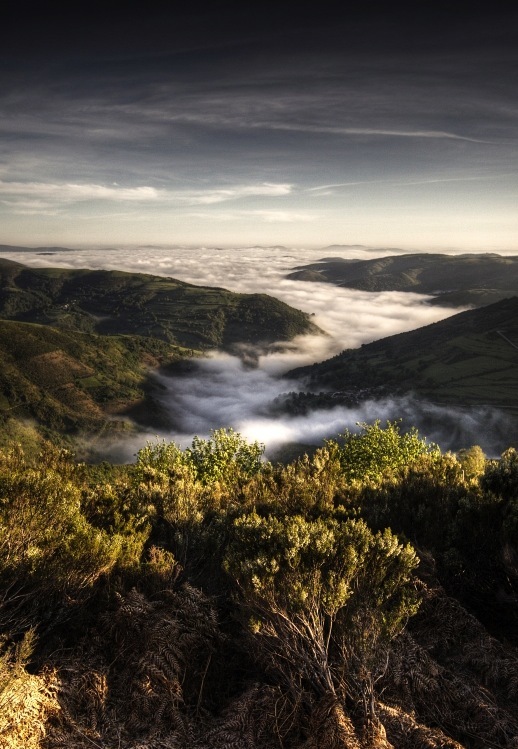 I awoke to the early morning beauty of O’Cebreiro and a stunning river of fog that trickled through the mountains. The town had marked my entrance into Galicia, and it was clear that it shared the Gaelic traditions of Ireland and Scotland. Despite being surrounded by the cutest round, stone houses with their straw rooftops and the endless shop windows advertising delightful wares, I was eager to hit the road and take advantage of what promised to be a dry day. I had a quick and nearly flat 6-mile jaunt that rose slightly to the second highest peak on the Camino, and then it was all downhill for another 20 miles or so. My body had once again miraculously repaired itself during my 10 hours of deadened, uninterrupted sleep. I certainly hadn’t expected to put in another long day after the beating of yesterday, but the views that floated along with the river were so amazing that I couldn’t stop myself from ambling across the uncluttered countryside. The biting, bitter cold pressed into me, aided by a ferocious wind, but the absence of rain felt like a blessing. I burrowed into my coat but kept my head up, delighted.